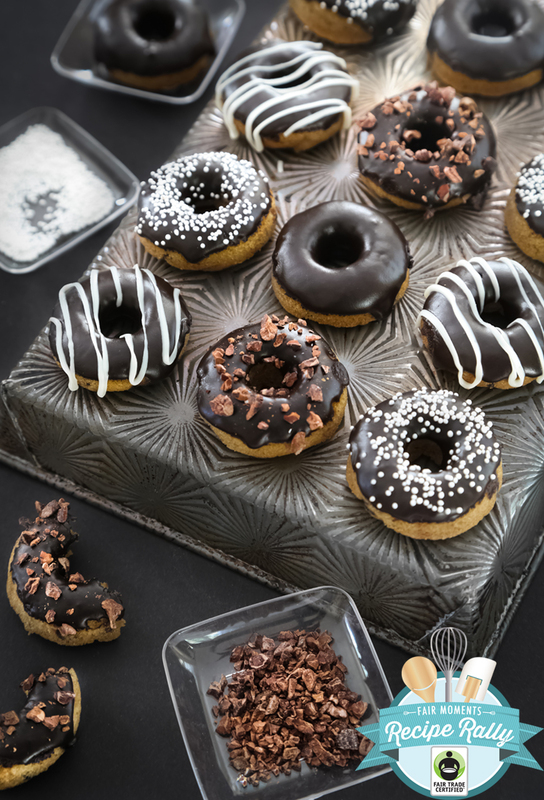 Chocolate Glazed Coconut Flour Doughnuts and a Fair Trade Giveaway! October is Fair Trade Month, and if you've been reading this blog for very long, then you know each year I join the efforts of Fair Trade USA to help promote this worthwhile cause. Buying Fair Trade means you’re getting high quality products and the people who grow, sew and craft them get fair compensation for their hard work. Today I have an awesome giveaway of Fair Trade Certified products for one lucky reader, along with something for everyone - a recipe for these sweet mini chocolate-glazed donuts! Just take a look at all of these goodies! This contest is open to US residents. The winner will be contacted via email. Contest ends Oct. 31. As for me, I zeroed in on the coconut flour. I tossed around several ideas before deciding on mini baked donuts. The baked donuts are cakey with mild coconut flavor. I used moscovado sugar and mini chocolate chips in the batter which gave the donuts a chocolate chip cookie flavor. I had inhaled three-ish right from the oven, but since they are 'mini' that only equals one regular donut. That's what I'm telling myself anyway! I prefer an assortment of donut toppings, so after the donuts were dipped in chocolate glaze I sprinkled 1/3 of the batch with white nonpareils, another 1/3 with cacao nibs (mmm my fave!) and the remaining donuts were drizzled with white chocolate. These little doughnuts taste indulgent even though they are baked and not fried. The coconut flour is a delicious, healthful alternative to wheat and other grain flours. I love that it's high in fiber and relatively low in carbs. If you have gluten intolerance, be sure to use chocolate chips that are gluten-free such as Sunspire. One more thing - the participating Fair Trade Month bloggers are having a friendly pinning competition. Check out our Pinterest Board to find new delicious recipes, and pin your favorites! This recipe requires the use of a mini donut pan. You can find them in kitchen specialty shops and online. Be sure to use chocolate chips and cocoa powder that are clearly marked as gluten free. See blog post for product referrals. Preheat the oven to 350°F. Lightly coat the cavities of a mini donut pan with cooking spray. Combine the coconut flour, moscovado, salt and baking soda in a large bowl. Whisk to incorporate. Whisk in the eggs and melted butter. Fold in the mini chocolate chips. Transfer the batter to a piping bag with a 1/2-inch opening. Pipe the batter 3/4 full into the donut cavities. Bake the donuts for 7-10 minutes, or until puffed and fragrant. Turn the donuts out onto a wire rack to cool. Wash the donut pan and re-grease; repeat process until all of the batter is used. When donuts are cool, prepare the glaze. Combine the powdered sugar and cocoa powder in a medium bowl. Whisk to combine. Whisk in milk or cream a little at a time until a thick, glossy glaze is achieved. 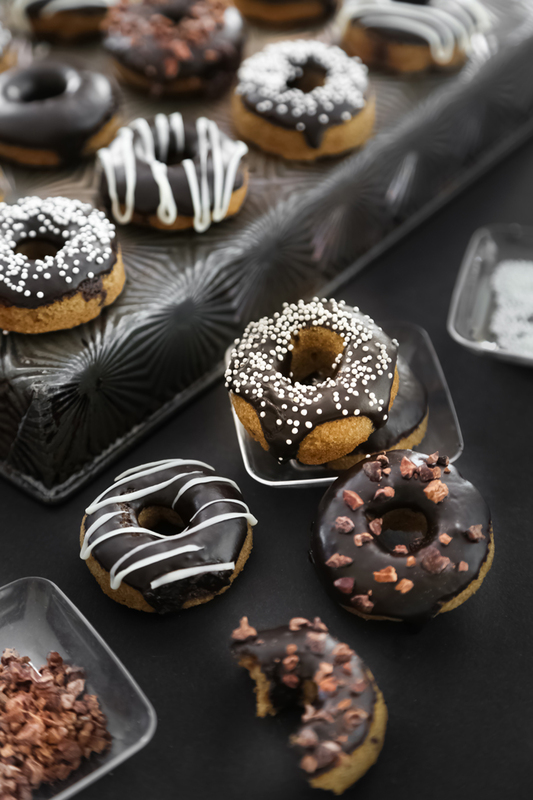 Dip the tops of each donut into the glaze and let stand 2 minutes; add sprinkles, cacao nibs and or other toppings. Let donuts stand until completely set, about 1 hour. Share with friends. Store the donuts in an airtight container. 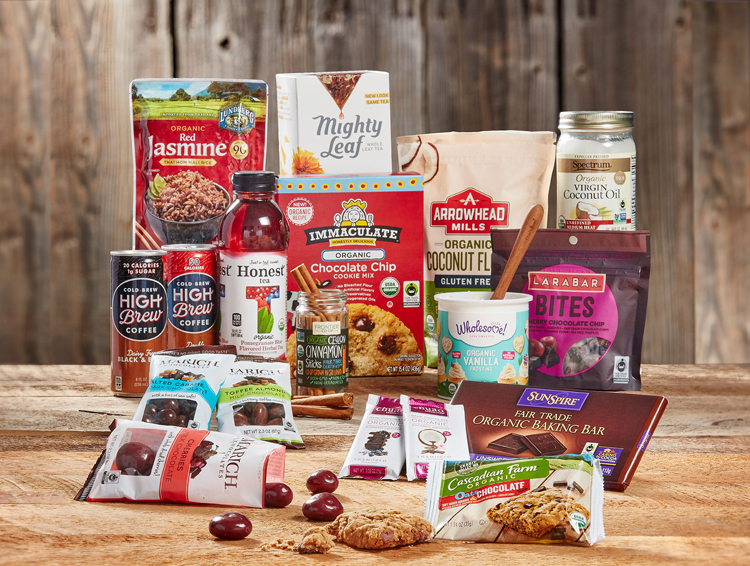 Wholesome!, Cascadian Farm Organic, Marich, Mighty Leaf, Chuao, Honest Tea, Larabar, Frontier, Sunspire, Spectrum, Arrowhead Mills, Immaculate, Lundberg, High Brew. I would definitely share/ make some goodies with a good friend of mine who has special dietary needs. These donuts look like the perfect treat! Can't wait to make them!! I love baking with coconut flour! These are on my must try list! I will bake some serious chocolate chip cookies! I would definitely make coconut / chocolate chip cookies! There is not a single item in that box that I don't to stuff directly into my mouth. Everything looks so good. And these donuts, yum! Coconut cream bars? Coconut flour always makes a nice chewy based. It's already fall but I'm still dreaming of summer! I would make some Halloween themed Chocolate Bark! The first thing that comes to mind is chocolate chip cookies!! I would make the famous SprinkleBakes cream cheese brownies!!!! Cookies, quick bread, all the goods! Some really yammi Brownies, following the recipe of my Grandma! These look so good! I would make browned butter chocolate chip cookies! I love this give-away!! Yay for fair trade!! Love Fair Trade products. I would bake some banana bread with chocolate chunks. I would definitely make cookies or brownies! Those doughnuts tho...they look amazing! I want to make chocolate chip cookies! It's been far too long. With the Fair Trade Certified products, I will bake a chocolate chip cookie cake. Pumpkin curry to go with the rice . . . Yum! I try to buy fair trade products whenever I can. I've never tried coconut flour, though. Hmmm... cookies? Maybe go half-and-half with the almond flour "paleo" cookies my kids and I love? These coconut flour donuts are so beautiful!! I would have to make your donuts! I would definitely make these!! They look delicious and coconut and chocolate is one of my favorite combinations!! I would make some chocolate pumpkin muffins. Them donuts look like the perfect item to start off with. I would make some chocolate cinnamon rice pudding. 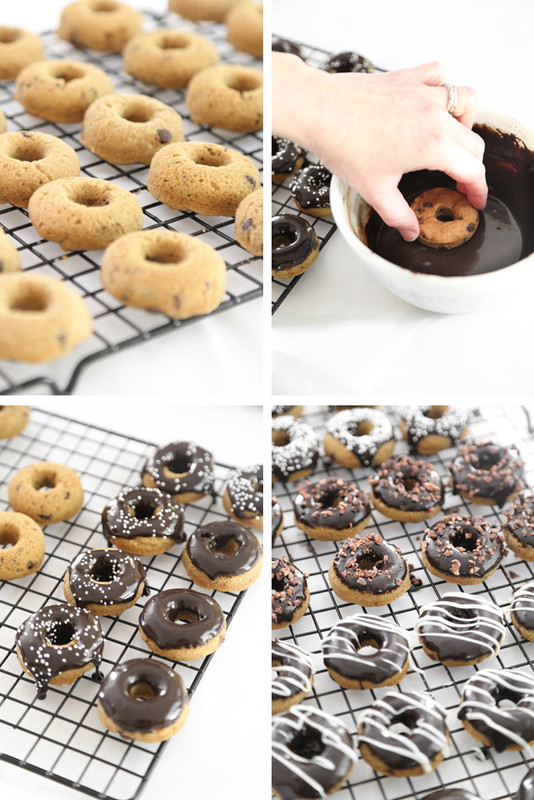 I'd love to try this donut recipe with these, they look amazing!! I would make the cookie mix first but add some of the cinnamon to them and make some chocolate chunk brownies with the coconut flour and maybe a chickpea curry with the jasmine rice. I've been looking for a good coconut flour recipe and can't wait to make these! I would bake cinnamon cake and cupcakes! Awesome box of goodies ,thanks for the chance to win it. Love using coconut flour and the minis look like a waiting opportunity. A cake for my daughter's first birthday! What a great giveaway! I'd make something delicious just for me and my husband...probably something with chocolate. I would make these delicious looking donuts! I would make chocolate cake. I would make a cake! I'd bake a dessert bars of some kind. I would make some cookies! I would make cookies & fudge! always on the lookout for gluten free - these sound super delicious! cinnamon & spice coconut bites! I have never baked with coconut flour and would love to try this recipe out. I think I'd have some friends over for tea and snacks. Adding the cinnamon sticks into the tea will be perfect for the chilly fall weather. I would bake cookies. Thanks for the giveaway. I would make cookies. Thanks for the giveaway. I would make chocolate chip cookies or either some pumpkin chocolate chip bread. I'm up for trying my hand at making mini donuts! I would make chocolate chip cookies. I've made coconut flour brownies and would like to try cookies. I would certainly make your little donuts for my mother who is gluten-free. And I'd like to try that red jasmine rice. Never heard of it - I'm going to search my local stores for it. I would bake chocolate zucchini muffins. I'm most interested to bake with (and drink!) that fair trade coffee. It lends such a richness to chocolate desserts! I love baking with gluten free flours! I would make something with chocolate, for sure. I will make chocolate covered, chocolate chip cookies! Thank you for the chance to win this cool prize! Something with chocolate... maybe some chocolate chip pumpkin bread? Tis the season. Thanks for this amazing giveaway! Ooh, I'd make some chocolate glazed bars! Love coconut flour! I like the taste of it with other fruits, so maybe an apple cake! I trust Heather's standards and yum factor. Would love to see more baking recipes made with gluten-free & diary-free ingredients. Yes, I am both. I miss cream cheese the most. These donuts look so good.. but i'll probably make some sort of chocolate coconut cake.. maybe go gluten free so my sis can have some too! Ooh, never tried coconut flour! I love the taste of coconut so this is a must try for me. oh my goodness what a yummy giveaway. Smoothies with the cold brew coffee, Texas sheet cake with the flour. I've never made anything with coconut flour and these look amazing! I just might have to give these a try. Tis the season for pumpkin bread! I have this amazing recipe using coconut oil to make chocolate chip cookies! I would make those! I'd make these donuts, of course! I'm thinking I'll try my hand at pumpkin with chocolate chip donuts. Oh I love experimenting with alternative flours! I have a bag of banana flour just waiting for a recipe. These look divine. I'm going to make some fair trade chocolate chip cookies! Apple cider donuts - and spiced apple cider! These look so yummy. I love trying new flours and thang people with allergies can enjoy more varieties of foods. I would bake some donuts and share it with the teachers. Thank you for the opportunity! Birthday cake! I'm making several this month! I'd rub the coconut oil directly onto my skin, honestly. But I'd love to make brookies with that chocolate chip mix. I would use items in the box to make the Halloween themed version of these amazing looking donuts... for my child's Halloween party at school. There are a handful of kidlets in her class who adhere to gluten free diets, so this donut recipe with coconut flour is perfect! I would make something with pumpkin and chocolate. I've been wanting to try my hand at baked donuts, and the addition of coconut oil sounds delicious! I think I'd have to top mine with coconut flakes for a tropical feel. rice pudding with those cinnamon sticks! I would definitely make a coconut cake! I would make coffee flavored brownies with a cookie dough frosting! I am a recent coconut flour convert and can't wait to learn many more uses! I would try your doughnut recipe. They look amazing! I would make chocolate chip cheesecake bars! I think I'd take the red jasmine rice and the coconut oil and make a killer stir fry (not really baking, but that would happen too)! i've been wanting to use coconut flour for so long! so i would definitely use that first and see if i can make brownies or cookies with it for the holidays. I love baking with coconut flour. These doughnuts look delicious- I'll be making them soon. I would definitely bake a flourless chocolate cake, and maybe put some chocolate cherries on top! Cookies! Lots and lots of cookies! So many awesome products and those look so delicious. I would make some chocolate chip cookies of course! Yummy!!! I would make some cinnamon and coconut breakfast bars using the coconut flour and oil. So good! I would make some snickerdoodles. I think I would make something like pumpkin pie bars but with homegrown butternut squash instead. I would make a chocolate cake of some sort! I would bake a chocolate cake. Those donuts look delicious. I think I would make some cookies first! I don't like coconut, but those donuts looks delicious. Thanks for the giveaway and recipe. I would probably bake some yummy cupcakes. I would start baking for the holidays! I have been gluten free for a year now and I love it! this products will come very handy in my kitchen! So happy to see more bloggers incorporate fair trade ingredients in their recipes! These look delicious too! I would make goodies for my mother, my best friend. I'd bake cookies and cakes. I'd bake some brownies with a chocolate chip cookie layer! With a can of frosting in the package, I think I might just have to bake a cake! (Chocolate, of course.) Thank you for hosting such a great giveaway! I LOVE fair trade products! I would make some cinnamon rolls and chocolate chip cookies! I would love to create a Thanksgiving dessert.I have never heard or used any fair trade products that I know of but would love to learn more about these items. I would make a simple coffee cake -- my favorite! I'd love to make some cookies! The donuts look so yummy - I like to make chocolate chip cookies and chocolate chip cupcakes! Everything looks good. I would probably make something simple like brownies. I would bake walnut chocolate chip cookies. I'd love to bake muffins and cookies with my son! I would make chocolate cupcakes!! I make some choc chip cookies, decorated with a cherry here and there. I'd also try out a funnel cake using the coconut flour. I'd bake your donut recipe! I LOVE donuts but have never baked them before! I'll bake some brownies and muffins. I will bake chocolate chip cookies. I would bake some of these doughnuts and cookies! I would bake some Blueberry Muffins with coconut flour!